Tom Waghorn started making and repairing musical instruments under the tuition of luthier Phil Davidson in early 1996 whilst working for Hobgoblin Music in Bristol. 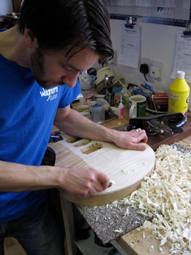 By March 2000 Tom was working from his own workshop at Clevedon Craft Centre, making a range of mandolin family instruments for local shops such as Hobgoblin Music and The Music Room as well as building acoustic guitars for private customers. In 2002 the move was made from Clevedon to a small workspace in Treblerock Music on St. Michaels Hill in Bristol and Tom concentrated solely on making guitars. After five years at St. Michaels Hill, having built up a large customer base for custom built guitars, repairs and setups as well taking on and teaching a couple of apprentices and launching the company's first website; Waghorn out-grew the back room of the guitar shop and moved to the existing workshop on Mill Avenue in the centre of Bristol. At this point Tom needed to address the rapidly lengthening waiting list by taking on a full-time employee in the form of Dave MacLean who played a large part in developing Waghorn's electric guitar range. After Dave moved on a couple of years later, Tom would recruit luthiers Max Day and Julie Hautecoeur to the fold.